My friends at Northern Runner have pledged an impressive amount to the 2 charities in return for some advertising space on this blog. I, myself, have been shopping at Northern Runner in Low Friar Street, Newcastle (just down from the Gate) since 2002 and know first hand the quality of service and goods they have to offer. Time after time they've analysed my feet and have always recommended the best shoes to suit my running style. Well it's 7 years and 1000's of miles later and I've hardly had an injury in all of that time and I've had some cracking running gear too from them from base layer to outer layer clothing. Why not check their website out here - www.northernrunner.com or pop into the shop. Don't forget to tell Charlie and the staff that I sent you! In the meantime, it's a big thank you from Run Geordie Run on behalf of the 2 charities for the kind support shown from Northern Runner. I'm awaiting the full details of tonight's body composition test but I can reveal that my overall weight has dropped to 15 stone 2 pounds! I'm very pleased indeed with that loss and it means I'm only 3 pounds away from my next target (95 kg in new money!). Remember, I was 16 stone 9 pounds in September! To put it into perspective, 95 kg is the weight that I was when I finished the John O'Groats to Lands End run. Over the last couple of weeks, I've noticed that none of my jeans fit me anymore. In fact, I was walking out of the the supermarket the other week with a carrier bag in each hand. Imagine my shock when my jeans started slipping down and almost ended up round my ankles! I caught them just in time thankfully! I've got a little target in my mind of being 14 stone by the summer. With the current work rate and diet there is no reason why I can't reach that target and possibly exceed it. None of this would be possible, by the way, without the support, encouragement and advice I receive from David Fairlamb and Mark Fleming on an almost daily basis. 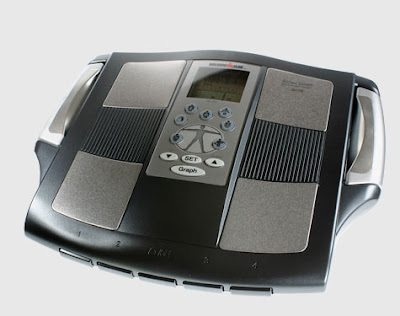 Watch this space for the full breakdown of tonight's Body Composition Test when I get it. Monday 19th January - 5 mile run, Race Course. (00:41:50). PB! Tuesday 20th January - 5 mile run, Race Course. (00:40:23). PB! Tuesday 20th January - 6 mile run, Shotley Bridge to Ebchester and back. (00:54:42). Wednesday 21st January - 10.4 mile run, Havannah and Race Course. (01:40:35). 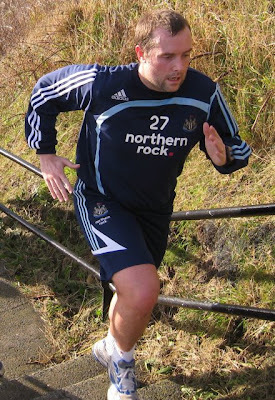 Thursday 22nd January - 5.1 mile run, Gosforth to Jesmond. (00:49:44). Thursday 22nd January - 1.5 mile run, Jesmond to Gosforth. (00:13:29). Thursday 22nd January - Personal Training Session. (01:30:00). Saturday 24th January - Beach Bootcamp. (00:45:00). Saturday 24th January - 11 x run up the steps. (00:27:32). There was a smashing article in Monday's Journal covering last Saturday's Beach Bootcamp and steps session. The article entitled "Mark stepping up to conquer American Coast to Coast run" explains "If Rocky Balboa was the Italian Stallion, then Mark Allison has a case for naming himself the Tynemouth Tiger. While the fictional character famously prepared for boxing bouts by scaling the steps of the Philadelphia Museum of Art, Mark has been using the Tynemouth equivalent to get in shape for a trek across America.". I must admit I did have a giggle when I saw the bit about being nicknamed The Tynemouth Tiger! Brilliant! I'm so pleased they picked up on the comparison with the Rocky movies and in particular the run of the steps of the Philadelphia Museum of Art. The steps at King Edwards Bay will be featured in Run Geordie Run The Movie, I'm sure, in years to come! The full article can be read by clicking here. There was also a video to accompany the story which can be viewed by clicking here. Please try not to laugh and do understand that it was cold and I had 3 layers of clothing on! Oh and the camera adds 3 stone etc etc! There were quite a few photos taken of the proceedings which can be viewed by clicking here. All you need to do is put "Mark Allison" in the search box and hey presto! With the Priory as the backdrop and the sunrise I must say that they are spectacular. Pity it has me in them! Anyway, thanks go to the Journal for more brilliant coverage of this crazy adventure. Each day offers an opportunity for improvement! This is week 12 of USA 2011 training and I've encountered my first disappointment. I haven't managed to get all of the required running in this week (55 miles)! That said, I've managed 33 miles of running, an intense 90 minute workout in the gym, Beach Bootcamp and 11 very difficult runs up the steps (pictured). I must say that the steps after Bootcamp have brought me to my knees this week. Just as it had been getting easier in recent weeks, this week's session was an absolute killer! Fortunately, as I said yesterday, I'm well ahead of schedule. It is apparent now that I must make the absolute best use of my time outside of work and home life. There is not an hour to spare in the week and the challenge is now to be able to stick to the plan and exceed it wherever possible. This is how I'll be tackling the mileage in the USA. Well, tomorrow offers an opportunity! My dedication is unquestionable (even if I do say so myself). Ask anyone that knows me. That one's in the bag. I hope I have the discipline to get up early before taking Jack to school to do a run. I hope I have the good judgement to eat the healthy things at the right time of day to give me the energy to run. The feeling that I can improve is central to everything I do in life not just running. That feeling won't disappear. Ever! I can't finish writing this tonight without a mention of those wonderful people who supported and encouraged me on the steps this week. Other than Dave Fairlamb and Mark Fleming, I've only met them through Beach Bootcamp. Everyone of them was wearing a Run Geordie Run t-shirt for this special steps session which was being photographed and videoed by the Journal Newspaper for their Monday edition and online video section. They put a lot of effort in themselves but still found the energy to support me. Not only that, the t-shirts that were worn have yielded £150 for the charities. Brilliant! Watch out later in the week for an update on the t-shirts where once I have collected a few more £10's in, I expect the latest t-shirt total to be over £600. I'll also be posting an update on the 3000 scheme where I have had a number of pledges to run in memory of lost loved ones. In the meantime, week 13 of USA 2011 training offers an opportunity for improvement. I fully expect to be writing, this time next week, about how I took that opportunity! Week 12 - Well ahead of schedule! I'm currently in week 12 of training for the 3100 mile run across the USA in 2011. Coaches and mentors, David Fairlamb and Mark Fleming both agree that I'm well ahead of schedule in terms of fitness and body composition. There is no room for complacency though and I'm determined as ever to make improvement week after week. As a reminder, my training plan is made up of 95% running for 1 week, then 95% gym work the next week. The mileage on the running week is currently 55. I add 5 miles to that every fortnight and the target is to get to 110 miles per week by July 2009. I've managed 33 miles so far this week leaving only 22 to do. I'll be hitting the gym next week for some Body Pump and Spinning classes as well as my regular 90 minute tough session with Mark Fleming at David Fairlamb's gym. And of course, the weekend wouldn't be complete without David Fairlamb's Beach Bootcamp and the subsequent (and now legendary!) runs up the steps in King Edwards Bay. Their is a growing crowd of people who stay behind after Bootcamp to tackle the steps. Their support and encouragement is brilliant and reminds me very much of the people accompanying Rocky Balboa up the steps outside the Philadelphia Museum of Art. You couldn't make it up! I'm pleased to report that I've recorded 3 PB's recently for the 5 mile run up to Newcastle Race Course and back. The last PB was set on Tuesday where John Brettell and Carl Hudson acting as pace makers also acquired PB times for this particular route. Wearing the new Brooks Glycerin 7 trainers, my final time was 00:40:23! I followed that up with a 6 mile run on the evening and the effect that the speed session had on the 10.4 mile run the next day was very noticeable! I found it very tiring! I've been getting a bit obsessed lately with running at speed. This is not what the majority of my training is about so I'll be focusing purely on getting the miles in for the time being. I'll have another crack at a PB in a few months time though. Watch this space! Finally, t-shirts sales have gone very well indeed in the first month. £510 has been raised so far and not only is this a great kick start to the charity fundraising pot but is also hopefully going to help spread the word about this epic run. For more information on t-shirts, please click here. I'm off to Beach Bootcamp now where the Journal Newspaper will be in attendance. They are going to film the Bootcamp and steps session and publish it on their website (www.journallive.co.uk). Watch out for that next week! Monday 12th January - Body Pump. (00:55:00). Tuesday 13th January - 5 mile run, Shotley Bridge to Ebchester and back. (00:49:52). Wednesday 14th January - 5 mile run, Race Course. (00:42:30). PB! Thursday 15th January - 5 mile run, Race Course. (00:43:24). Thursday 15th January - Personal Training Session. (01:30:00). Friday 16th January - 5 mile run, Race Course. (00:49:04). Friday 16th January - 5 mile run, Shotley Bridge to Ebchester and back. (00:47:21). Saturday 17th January - Beach Bootcamp. (00:45:00). Saturday 17th January - 11 x run up the steps. (00:24:21). The Brooks / Run Geordie Run partnership gets off to a flyer! 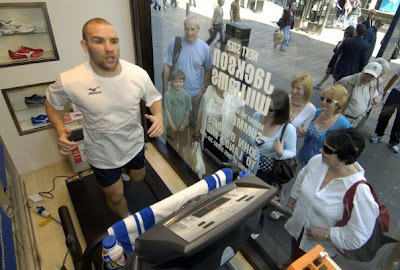 Brooks today announced their support of Run Geordie Run with a news article on their website (www.brooksrunning.co.uk) stating "Brooks have teamed up with local hero Mark Allison......". It's a great bit of publicity for the cause and adds a nice touch to yesterday's presentation. Some of the new kit was put to the test today on a 5 mile run as I decided to try the Brooks Gossamer Quarter Socks that I had been given yesterday. This might sound like a load of old tosh but after 1/4 mile my feet felt unbelievably comfortable. They do anyway in my Glycerin 6 trainers, but these socks took comfort to a whole new level. I can't imagine how it'll feel when I get to try them with the new Glycerin 7 trainers in February. I'm turning into a right old running geek! Anyway, back to one of the most comfortable 5 mile runs in history ever! I started off with John Brettell who was doing 10.5 miles today as part of his marathon training. We had a bit of banter and I left him after 3/4 mile as he does this run/walk break thing. The first mile was a quite slow (for me these days) at 00:09:02. I soon quickened things up a bit and before I knew it I was posting an average of 00:08:30 minutes per mile. Now it was only last week when I set a PB of 00:42:43 for this route up to Newcastle Race Course and back. But not one to rest on my laurels, I smashed that record with a final time of 00:42:30. I'm pleased I dawdled a bit on that first mile as it gives me a chance of setting a new PB soon! I put the PB of 00:42:30 down to the new socks! I'm not getting carried away though (Aye right!). My training isn't really about running as fast as I possibly can. It's about putting my body through as much stress over as many miles as I can and learning how to recover from it in order to do it all again the next day (and the day after etc etc). This is how I prepared for the 874 mile run from John O'Groats to Lands End in 2007. The USA run is 3.5 times the distance however! Mind you with the new kit from Brooks anything is possible! Picture the scene, if you will. Midday in Newcastle's premier running shop; Northern Runner, where Gavin the rep from Brooks Sports (pictured with yours truly) is there with a load of goodies for me. Amongst the training tops, running socks and water bottles are a brand spanking new pair of Brooks Glycerin trainers. These are the class of shoe I currently wear. What I didn't expect though was that this particular pair donated by Brooks was the very latest model - Brooks Glycerin 7! Apologies for sounding very geeky but when you have struck such a partnership and have come to depend on such an item as a pair of trainers then that's what happens. The Glycerin 5 trainers got me safely through 874 miles from John O'Groats to Lands End in 2007. I currently wear the Glycerin 6 trainers and will be putting the new ones to the test in February when they are due for replacement. This should be after about 600 miles of wear. Anyway, back to Northern Runner where that nice photographer from the Journal Newspaper was on hand to take a few shots to accompany an article that will be in tomorrow's edition. There were a few shots outside the shop, some inside with shop owner Charlie and finally some down the famous corridor where many a runner has tried out a new pair of trainers before committing to the purchase. All in all, it was a great little photo shoot and hopefully tomorrow's article will bring some good publicity to the cause. It's getting almost a daily occurrence now this task of thanking people but I do have to give sincere thanks to Martin Exley and Gavin Bannister of Brooks for the supply of some very nice kit. All items will be put to very good use indeed. Having put their shoes to the test in extreme conditions and over 2500 miles over the last 2 years I can say that the quality of the shoes is outstanding. You've only got to look at the distance covered versus my virtually non existent injury record for that proof! Throw into the mix the comfort that these shoes provide and you've got running shoe perfection. But don't just take my word for it. If you are thinking of buying some new running trainers why not let Charlie, John and the staff at Northern Runner diagnose your foot type (there's a posh word for it but it escapes me at this moment in time) and let them guide you to the right type of shoe. They stock all kinds of makes and types but I would personally encourage you to give Brooks shoes a try. 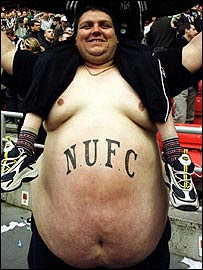 Oh and while you're there tell them that Run Geordie Run sent you! Meeting with the Kit Sponsors tomorrow! Those canny people at Brooks Sports certainly don't mess about! 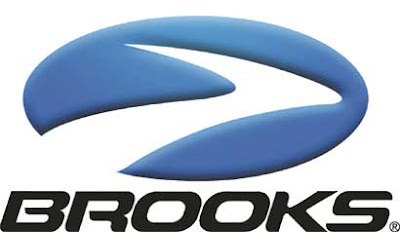 Tomorrow will see me receive a bundle of training goodies from a Brooks representative. The presentation will be done at Northern Runner in Newcastle at 11:30 with the world's media in attendance. Well ok then, my favourite newspaper; the Newcastle Journal. Watch this space for more details tomorrow. Oh and speaking of the Journal. Have you seen David Fairlamb's fitness guides on the Journal Live website? You can access them here. I must say that I'm very much looking forward to receiving a brand spanking new pair of Brooks Glycerin trainers. For those not in the know, these are the shoes that I ran from John O'Groats to Lands End in and the ones I use in training for the USA 2011 run. In comfort terms they are like running in a pair of slippers! And believe you me, when you are 600 or so miles into a long tour they are just what you need! Monday 5th January - 5 mile run, Race Course. (00:46:21). 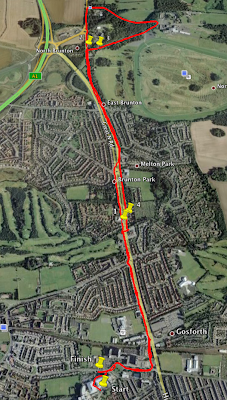 Tuesday 6th January - 6 mile run, Town Moor. (00:54:43). Tuesday 6th January - 4 mile run, Gosforth Round the Block and back. (00:39:34). Wednesday 7th January - 10.4 mile run, Havannah and Race Course. (01:31:58). Thursday 8th January - Personal Training Session. (01:30:00). Friday 9th January - 5 mile run, Race Course. (00:42:43). PB! Saturday 10th January - Beach Bootcamp. (00:45:00). 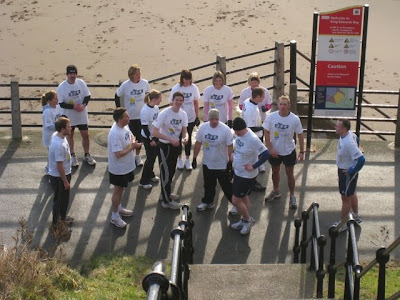 Saturday 10th January - 11 x run up the steps. (00:25:11). Saturday 10th January - 8.5 mile run, Tynemouth to St Mary's Lighthouse and back. (01:24:50). Sunday 11th January - 11.1 mile run, Shotley Bridge to Hamsterley Mill and back. (02:00:52). Jack's the lad to lead the way. 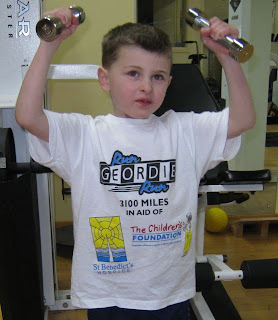 My son Jack (pictured in David Fairlamb's gym) was the first lucky recipient of a Run Geordie Run T-Shirt back in December. Since then, sales have gone really well and a second batch has already been ordered. Custom Planet in North Shields have done a sterling job with the production of the t-shirts and I've had some really good feedback from the good folk who've bought them. Thanks to Peter McCowie, all proceeds from the sale of the t-shirts will go to St Benedict's Hospice and The Children's Foundation. 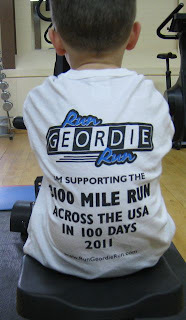 T-shirts are priced at £10 and feature the Run Geordie Run logo on the front and back. The front also has the 2 charity's logos. On the back the message "I'm supporting the 3100 mile run across the USA in 100 days 2011" is shown along with the www.RunGeordieRun.com address. The sleeves have 2 logos. The first is Custom Planet, producers of the t-shirts. The second is the David Fairlamb Fitness logo. What's more, the t-shirts are screen printed so they'll last for ages! I've ran over 100 miles and have had a few gym sessions in the t-shirts I have and they are as good as new after each wash. Needless to say, it's not me that washes them! The t-shirts are available in sizes Small, Medium, Large, Extra Large and Extra Extra Large. If you would to contribute to 2 very worthy causes with the purchase of a t-shirt the n please get in touch at sponsorship@rungeordierun.com. All payments are made securely at www.justgiving.com where the charities receive the money directly. 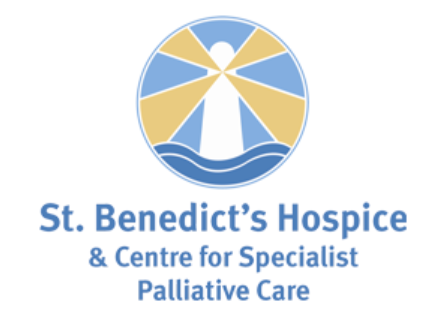 The following is a reminder as to how important the services that St Benedict's Hospice and The Children's Foundation provide to people in the North East. The Children's Foundation "provides leadership and raises funds to enable research, support service delivery and create partnership programmes, designed to improve the health and well being of children and young people in the North East.". You can read all about their achievements here or by visiting www.thechildrensfoundation.co.uk. So, if you would like to make a real contribution and get a very good quality t-shirt in return then please click this link sponsorship@rungeordierun.com. I got some brilliant news today! Brooks Sports Ltd have offered to supply me with shoes and kit. Regular readers and running colleagues will know that I have worn Brooks shoes for the last couple of years. They were the shoe that I ran in from John O'Groats to Lands End and I adore the Glycerin type of shoes. I've always said that they are like running in a very comfortable pair of slippers. Which was nice when you're, say, 400 miles into an 874 mile tour! Thanks to Brooks and Martin Exley in particular for arranging this valued support. With the USA 2011 tour being funded out of my own pocket, any help towards reducing it's cost is most appreciated. This will certainly go some way to reducing that cost. It's a 50 mile week this week and Friday saw me run miles 26 - 30 for the week. To say that I'm enjoying my running at the moment is an absolute understatement and once again it showed on a cold lunchtime in Gosforth. Speed merchant Dave Francis and the ever reliable Carl Hudson were my company for the run from Regent Centre to Newcastle Race Course and back. My previous best for this one was exactly 43 minutes. Thanks to the other 2 lads setting a good pace, I beat that previous best with a time of 00:42:43. As I said earlier in the week, confidence and fitness is reaching a whole new level. Every time I do something now I feel stronger and fitter. With 3 stone or so to lose it's going to be a while before it evens out too so expect more stories like this. The story I'd really like to write, though, is about beating my 1995 running times - 17 minutes for 3 miles and 43 minutes for 10k. I'm constantly thinking of the stories and headlines in my mind. It's then a case of doing the actions to make them a reality. Once upon a time, back in 1993, the headlines were simply to run 3 miles round the block! Those were the days! A new short term challenge. Oh and what a challenge! Well then! Where do I start with this one? Are you sitting down? Ex pro Boxer and accomplished ultra marathon runner Jackson Williams (pictured) tonight issued a challenge with an invitation to join him on a 125 mile bike ride and 125 mile run. The mammoth distance from Norwich to London and back will be done over the duration of 48 hours in aid of Sport Relief! The date of the event is 15th and 16th March leaving only 9 weeks to try and get as prepared as I can possibly be for it. I'll post more details as and when I get them. In the meantime, there is no doubt that this is a massive, massive challenge. If successful, it will certainly accelerate the progress of my USA 2011 training. In the words of Lance Armstrong - "Anything's possible. You can be told you have a 90% chance or a 50% chance or a 1% chance, but you have to believe, and you have to fight.". I'll hopefully have a revised training schedule in place by the weekend! It's still very early days but after today's body composition test there is further proof that the hard work is starting to pay off. In September, Mark Fleming set me a target weight of 100 kg. That's a weight loss by the way, in case you were wondering! Back in September, I weighed in at 105.6 kg (16 stone 9 pounds). My body fat was 28.6%, visceral fat rating (fat around major organs) was 12 and metabolic age was 52. That's not good! That's not good at all. These aren't the kind of stats of someone who wants to run 3100 miles in 100 days! I'm pleased to report that there has been an improvement since that first weigh in. My weight is now 99.5 kg (15 stone 9 pounds). That's a stone in weight lost. That's not the full story though as I've lost 1 stone, 6 pounds of fat and gained 6 pounds of lean muscle weight. As a result my body fat is down to 21.3%. That's a 7.3% loss since September! The visceral fat rating is down to 8 and my metabolic age is down to a whopping 36! That's a year less than my real age and 16 years less than September! The next target is 95 kg. That's 14 stone 13 pounds! That's the weight I was when I finished the 874 mile run in Lands End. Once again thanks must go to Mark Fleming and David Fairlamb for their continued support and motivation. And here's to the next milestone. I've got a feeling it will be achieved sooner rather than later! Confidence and fitness reaching a whole new level. I'm writing this post on the back of a super 10.4 mile run around Gosforth today. Running with a few of the other lads, we decided to run up to the Havannah Nature Reserve and then Newcastle Race Course. The other lads stayed in a pack and were having a 1 minute walk break every 7 minutes. That walking lark is not for me though! This meant that they would catch me up for a while then drop off for a while. 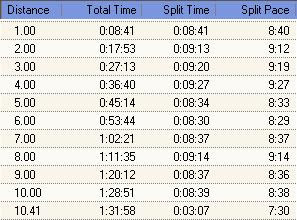 This really threw me off my rhythm in miles 2, 3 and 4 as you can see from the split times. Enough was enough and I decided to increase the pace and try and put some distance between myself and the pack! I kept looking over my shoulder and the gap increased through miles 5, 6 and 7 with some good controlled running. In fact, if you take out mile 8 which I used to get my breath a bit then the pace was very consistent with only a 9 second variance between the later miles. My initial plan was to fend them off until mile 7 but I felt really good and relished the challenge of being pursued. It was very similar to when Steven Moore and I raced in the Cairngorms. You can read about that day here. When I got to the Race Course, I could see the chasing pack of Carlton Fletcher and John Brettell through the trees! They closed the gap at 9.4 miles to the length of the bridge near the 3 Mile Inn on the Great North Road. As I left the bridge they started on it. I thought for a second that they were going to catch me so I tried to increase the pace even further. I got a good rhythm and technique going and made good use of my arms just as I do up the steps on a Saturday morning. My pace was enough to see me back home first and John wasn't too far behind with Carlton nowhere to be seen! I can't tell you how pleased I was with the final time of 01:31:58. I've actually ran 8.4 miles in around that time last year. To do 2 more miles on top of that in a similar time is very exciting indeed! I know I'm training for an ultra-distance run but part of me is wondering if, when I get down to my 1995 weight of 12 stone, will I be able to run the kinds of times that I used to run in 1995? I used to do this 3 mile run around Washington. The first 2 miles were at 00:05:30 pace with the final one at 00:06:00 pace. I'll definitely be trying that one before the year is out! Back to the present time! That's 25.4 miles done for the week with 24.6 left to do on top of a personal training session tomorrow and Beach Bootcamp on Saturday. Today's run and a hilly 11 mile run I did last Friday in the Pennines (is there any other kind?) has really served as an indicator of where my fitness levels are. And the easier than normal personal best of 11 lots of steps on Saturday morning tells me a lot too. This is only week 10 of USA 2011 training! There are 120 weeks or so left and there is still about 3 stone to lose in weight. I'm starting to wonder just how much improvement can be made during that time? With the confidence and motivation I currently have, I reckon this is just the tip of the iceberg. I now have a genuine hunger (not the usual kind) to push myself and run further and faster every time. Confidence is sky high. I'm now looking forward to finishing off the week in style again and hitting the planned 50 mile target! This week will see me run 50 miles and, at the time of writing, I've already managed 15 in very cold conditions! Next week will be the usual mixture of running, spinning, body pump and gym work before I increase the mileage to 55 miles the following week. This is the pattern I'll be following until the summer. i.e. increasing the mileage every fortnight until I get to 110 miles per week in July. It's a case of so far so good in 2009. No injures. No illness. Long may it continue. Tuesday 30th December - Personal Training Session. (01:30:00). Wednesday 31st December - 7 mile run, Shotley Bridge to Low Westwood and back. (01:04:50). Friday 2nd January - 11 mile run, Shotley Bridge to Whittonstall and back. (01:45:19). Saturday 3rd January - Beach Bootcamp. (00:45:00). Saturday 3rd January - 11 x run up the steps. (00:27:48). PB! Sunday 4th January - 5 mile run, Shotley Bridge to Ebchester and back. (00:44:57). PB! One thing is for sure, although I will be running across the USA in 2011 on my own, it can't be done without the help of a few people who are worthy of mention. Two of the most important people associated with the run are David Fairlamb (below left) and Mark Fleming (right). You can read all about their importance to the project here. In a nutshell, though, these 2 guys' aim is to ensure that I'm in peak condition for the run, both physically and mentally. Good luck with that one lads! All joking aside, though, I'm already starting to feel the benefit of having these 2 guys on board. Mark puts me through my paces on a weekly basis in the gym and keeps a critical eye on my body composition stats every month. He's always on my case about nutrition and diet and is the key reason why I've lost a stone in fat since September. Qualifying in 2008, Mark has just started out with his personal fitness career and has already got a growing list of clients. One thing I can honestly say, though, is that you'd think he'd been doing personal training for years. His enthusiasm and motivational nature is second to none and will be called upon numerous times during the next 2 1/2 years of training. David Fairlamb takes Beach Bootcamp, of course, and the benefits, the challenge and the enjoyment I get from it is well documented here and here. I have met some great people at Bootcamp and they are always full of encouragement and keen to know how my training is going. David will be another key motivator and will take some part in overseeing my training over the next few years. David's years of experience and advice will be his major contribution to the project. Again, he will be called upon many times during the next 2 1/2 years. Other folk very worthy of mention are the people I run with at Northern Rock; Carl, John, Carlton, Patrick, Jeff, Julie and Colin to name but a few. There are times, especially in the early days of pre-training, where this lot dragged me round and provided valuable company to keep me going. Hopefully, this will continue in 2009. Finally, it is the many sponsors and supporters who will ultimately put the icing on the USA 2011 cake. Without them, this whole project would not be worth doing. With them, however, we are likely to succeed and very likely to hit that fundraising target for 2 very worthwhile North East charities. Happy New Year!